Tie up your Christmas shopping for family, friends and yourself with great discounts on Christmas stamp sets and accessories from Stampin' Up! 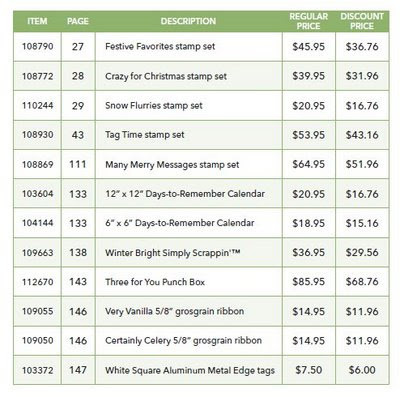 From 1 - 31 December, spend $20 on any Stampin' Up! merchandise and qualify for 20% off selected stamp sets and accessories. Contact me if you would like to order any of these items. If you want anything by Christmas, please order before December 12. Here are the Christmas cards we made in the Christmas card workshop last week. They all use the "Season of Joy" stamp set, which is in the Spring Mini Catalogue, which finishes on November 30. It's a very versatile set as you can see, so I'm sorry to see it go. If you would like to order this set, please contact me asap. These card designs are "cased" (copy and share everything) from the lovely Marelle Taylor, whose blog is a constant source of inspiration to me.